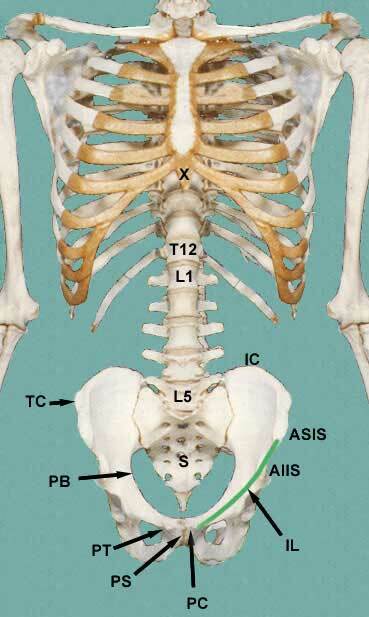 The inguinal ligament extends from the anterior superior iliac spine ASIS to the pubic tubercle PT and is used as one of the lower borders of the abdomen. This ligament is really a turned under edge of the aponeurosis of the external abdominal oblique muscle. We will mention it again when we cover the inguinal region of the abdomen. The thoracic diaphragm separates the abdominal cavity from the thoracic cavity. Before getting into the nitty gritty of the abdomen, keep in mind that you want to be able to use your knowledge to project the anatomy onto the surface of the abdomen. 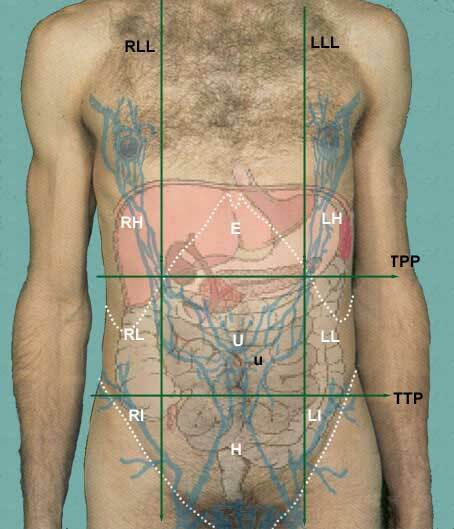 You will want to be able to visualize the relative positions of abdominal organs as they lie within the abdomen. Clinicians might use several different ways of subdividing the surface of the anterior abdominal wall but I will only present two of them here. By subdividing the surface into regions, one person can tell another person exactly where to look for possible problems. These regions are formed by two vertical planes and two horizontal planes. 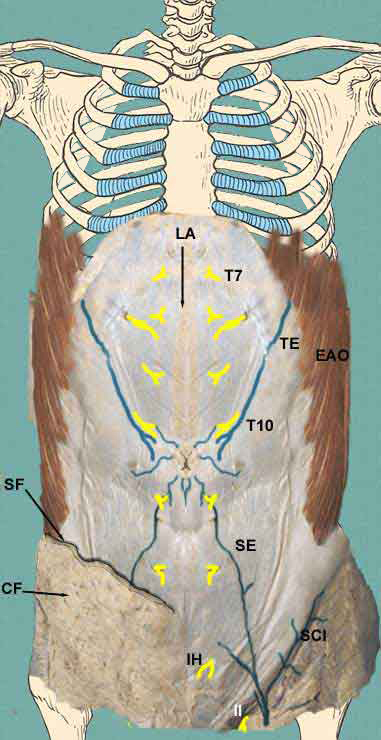 The two vertical planes are the lateral lines LLL and RLL. These lines are dropped from a point half way between the jugular notch and the acromion process. The two horizontal planes are the transpyloric plane TPP and the transtubercular plane TTP. The tubercles are the tubercles of the iliac crests. As a student of anatomy, it is sometimes fun to pretend that you are going to be a surgeon and are, at this point, considering entering the abdominal cavity to remove or reconstruct something in the abdominal cavity. It would helpful if you knew what makes up the wall of the abdomen so that you would be able to judge how deep you have gone with each knife cut. This brings us to the discussion of the abdominal wall. When considering the abdominal wall, you will need to know where, specifically it is that you want to enter. The layers of the abdominal wall vary, depending on where it is you are looking. For instance, it is somewhat different along the lateral sides of the abdomen than it is at the anterior side. It is also somewhat different at its lower regions. 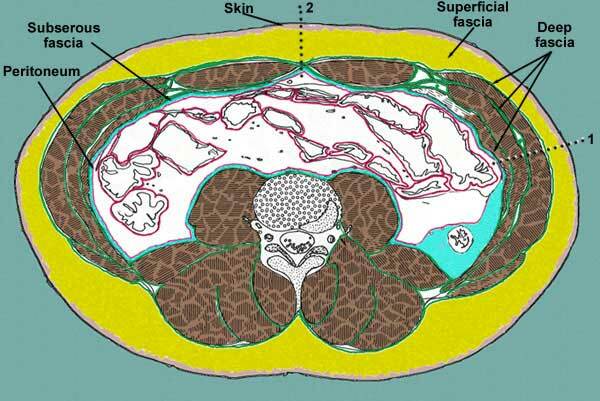 deep fascia (all skeletal muscle is surrounded within its own deep fascia). The deep fascia of the abdominal wall is different than that found around muscles of the extremities, however. It is of the loose connective tissue variety. It is necessary in the abdominal wall because it offers more flexibility for a variety of functions of the abdomen. 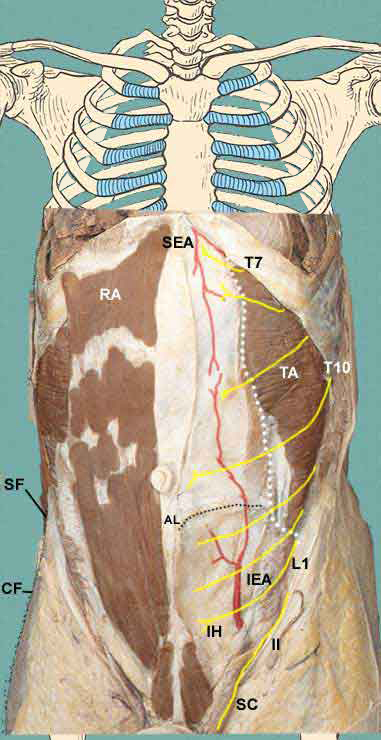 At certain points, this fascia may become aponeurotic and serve as attachments for the muscle to bone or to each other, as is the case at the linea alba. and also into a minor, but important vein, the paraumbilical vein PU. The paraumbilical vein drains into the portal vein and then through the liver. This is an important clinical connection. The lower abdominal wall is drained by way of the superficial epigastric SE and superficial circumflex iliac SCI veins into the femoral vein. The upper abdominal wall is drained by way of the thoracoepigastric TE and lateral thoracic LT veins into the subclavian. It is now time to consider the muscles that make up the anterior and anterolateral abdominal wall. There are 4 pairs of muscles to consider. We will remove layers carefully to see the deeper levels. As we go deeper through the layers, you should be aware of the cutaneous veins and nerves that travel in the layers. Notice on the right side of the specimen that the lower part of the superficial fascia has been left behind so that you might see its two layers, the fatty layer (Camper's fascia) CF and the membranous layer (Scarpa's fascia) SF. Running through the fatty layer are the superficial veins, the superficial epigastric SE, the paraumbilical veins radiating out from the umbilicus and the thoracoepigastric vein TE. The cutaneous nerves to the abdomen are mainly continuations of the lower intercostal nerves (T7 - T12). An important level to remember is that the umbilical region is supplied by the 10th intercostal nerve. The lowermost part of the abdominal wall is supplied by a branch of L1, the iliohypogastric IH nerve. Its other branch is the ilioinguinal II nerve. You should also identify the linea alba LA. This white line is where the aponeuroses of the external abdominal oblique, internal abdominal oblique, and transverse abdominis muscles converge at the midsagittal part of the abdominal wall. 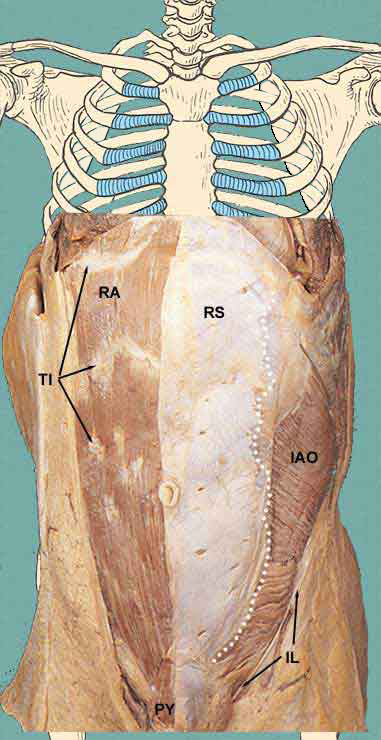 The anterior wall of the rectus sheath RS has also been removed on the right side in order to see the underlying right rectus abdominis RA muscle. Note that the rectus abdominis muscle is subdivided into small sections by so called tendinous inscriptions TI. This arrangement is what forms the wash-board abs in well-exercised people. We will discuss the formation of the rectus sheath in a moment. You may also see a small muscle overlying the inferior end of the rectus abdominis muscle, the pyramidalis muscle PY. This small muscles tenses the lower part of the linea alba. In this specimen, the rectus abdominis muscle, internal abdominal oblique and anterior rectus sheath have been removed. 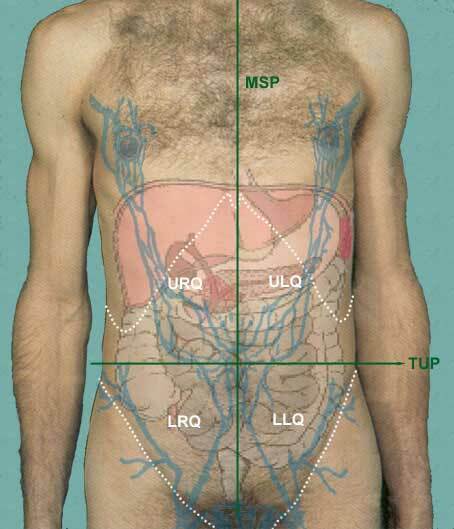 You can identify the posterior rectus sheath and its lower free margin, the arcuate line AL. What you see below this line is the transversalis fascia and running in the fascia is the inferior epigastric artery IEA, a branch of the external iliac artery. This artery enters the rectus sheath posterior to the rectus abdominis muscle and supplies the anterior abdominal wall. Extending from the top, is a branch of the internal thoracic (or mammary) artery, the superior epigastric artery. Also note that the cutaneous nerves are found to lie between the internal abdominal oblique and the transversus abdominis muscles.